When teaching the Bible to children, I constantly try to think of ways to make the story applicable and age appropriate. I came across an idea for the 10 Lepers in The Big Book of Christian Crafts . 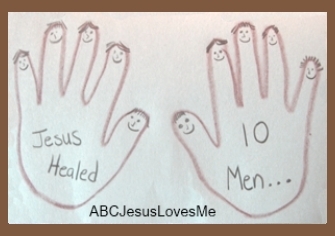 I tweaked it to make it easier for preschoolers and added it to the 5 Year ABCJesusLovesMe Curriculum as a craft project. Onto a piece of paper, trace around the child’s hand or paint and stamp a handprint. Show all 10 fingers for the first page. On a second piece of paper, trace or stamp with only one finger up. 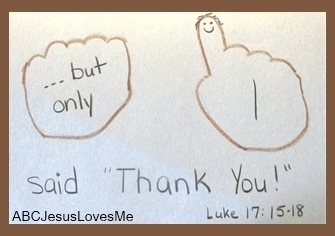 Add the title “Jesus Healed 10 Men…” to the first page and “…But Only 1 said “Thank You!” to the second page with the scripture reference of Luke 17:11-19. – Memory Verse Maze (Reprinted with Permission) Create a maze throughout the house with yarn. Add zigzag and wavy lines. Along the maze at different intervals, tie three bows on the yarn. Have the child walk along the yarn and stop every time he comes to a bow. Have him repeat the memory verse at each bow. 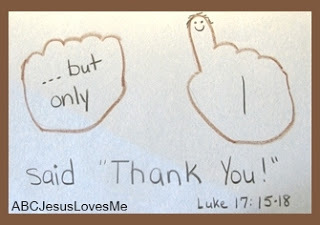 Then say one thing which you are thankful. 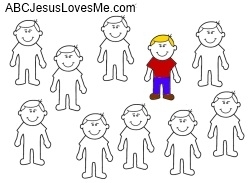 Head to the ABCJLM website to see more 10 Leper ideas like these.